An inner monologue from New York's wandering hero. Editor's Note: One of my goals for the next few months is to try and produce one humorous short scene per week. I will be submitting all of these to the "Shouts and Murmurs" blog on The New Yorker Website and all the entries that don't make it (whether funny or not) will land here from time to time. 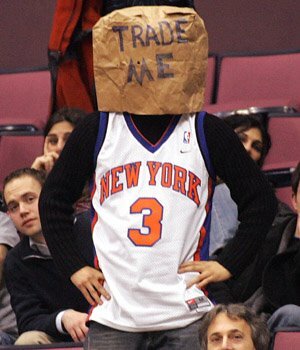 The New York Knicks. I was never serious about going to China, but I do love Yao and my therapist thought it might be good for me to immerse myself in another culture. You know, see how they do things over in China. New York, though. Man, it’s going to be good to be back in the city again. There’s so much I’ve got to do. I can hit up all my old spots. Go back to Queensbridge. Everyone’s going to make a big deal about me going back to New York, but I’ve done it before. I guess this time it’s really like going home. Except maybe I won’t go back to that court where I saw the guy get stabbed by the broken chair leg. Nah, but it’s all about helping the community out now. The City’s changed a lot, man. I could get down with Brooklyn. Except Williamsburg is kind of more of an amusement park than Disneyland or Los Angeles. That’s alright—I don’t even have to go there, but I bet I could find some rare instruments for my next album. Or just for practicing. Maybe we can sign Lamar and he can have a homecoming too. His wife would like living in New York just as much as Los Angeles. She even liked Dallas—all that barbeque. If Lamar comes here then he and I can go around handing out candy for candy drives. We’ll give out Skittles to some of those undernourished hipsters. Or maybe we could give out candy on the subway like everyone used to. No, that’s too silly. I’ll ask Coach Woodson about signing Lamar anyway. I’m sure we can use him. I worry about Kobe. I hope that he’s alright when I’m gone. Poor guy was broken up to see the Lakers amnesty me. He never knows where to put his emotions. I’ve been telling him for years to see my therapist; or to least see a therapist to get his feelings out. Man, but he’s just too proud. I get it. It’s cool, I mean, I know how that can be. I guess he’s still got all of Phil’s old book recommendations and mantra tips. I just think Kobe needs to stay off Twitter. It gets him all riled up. It’s not good for him—he doesn’t know how to get silly with it. Speaking of Twitter: that reminds me, I’ve got to follow up on that Geico tweet. Maybe I can do like a celebrity class at the Central Park Zoo or make some kind of donation to the lizard house at the Bronx Zoo. I was serious about that dream I had; I really thought that I was a gecko for a second there. I don’t have anything against geckos, but it was weird and it freaked me out just a little bit. But it was interesting to see the world as a lizard. I have a new respect for those guys now. All the stuff they do and have to go through. It’s not easy. The Garden’s going love me though, man. I’m not being vain. It’s just that New Yorkers know how to show appreciation. I wasn’t ready to be in the spotlight in this city back in 1999. And the Knicks weren’t ready for me either. Now, we’re reunited. Now, we can truly appreciate each other. We’ve been through highs and lows, 9/11, Detroit, therapy, court appearances and depression. 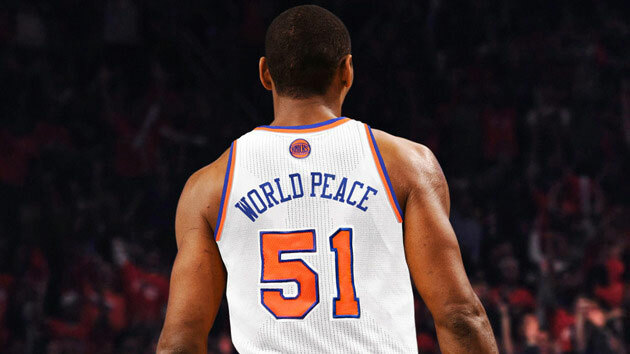 I’ve got two years to show New York just how much Metta World Peace has learned and how far he’s come from Ron Artest out of Queensbridge. And then when it’s all over, I can still hit up that Arena Football League deal. My therapist says to never stop trying new things. And who am I not to listen? Puddles of My Fiction: "Baby Shower"